North Korea on Wednesday broke its silence about its burgeoning mood of conciliation with the United States, cautioning hardliners in Seoul and Washington against trying to "spoil the atmosphere." The official Korean Central News Agency called for the two countries' "prudence and patience," saying its ties with them are at a mere beginning level. It slammed former and current officials in the US and Japan, as well as conservatives in South Korea, for "distorting the truth" about its reconciliation efforts by saying sanctions have brought the North to the negotiation table. 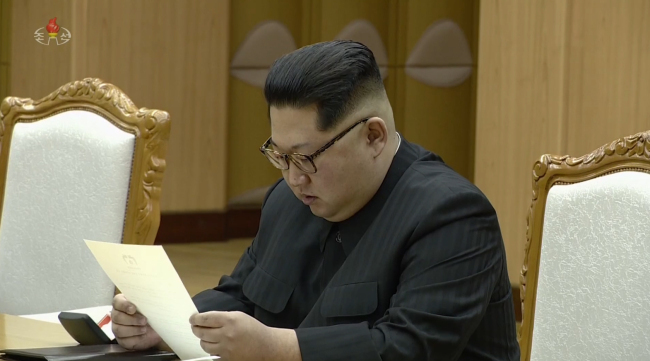 "It is really an expression of small-mindedness for the riffraff to spoil the atmosphere and say this or that even before the parties concerned are given a chance to study the inner thoughts of the other side and are seated at a negotiating table," the KCNA said in a commentary. "We do like to remind that it is time for all to approach everything with prudence and with self-control and patience," it added. The KCNA did not directly mention its leader Kim Jong-un's planned summit with South Korean President Moon Jae-in in late April and a possible meeting with US President Donald Trump that would take place by May. But it briefly said that a dramatic atmosphere for reconciliation has been created between the two Koreas, and there has also been "a sign of change" in its ties with the US. Trump has agreed to a meeting with Kim after a year of heightened tensions sparked by North Korea's nuclear and missile programs. A mood for rapprochement was created in inter-Korean relations by the North's participation in the PyeongChang Winter Olympics.